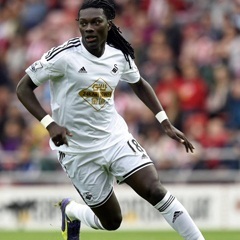 Birmingham - Bafetimbi Gomis' late strike clinched a deserved 1-0 win for Swansea as Aston Villa failed to climb away from the Premier League relegation zone on Saturday. The forward bagged his sixth goal of the season with just three minutes left as the game looked to be heading towards a stalemate. Jefferson Montero's excellent low centre ball found Gomis who fired in from six yards. Gomis had been denied twice by Brad Guzan, and Wayne Routledge had a shot cleared off the line as the Swans made most of the running at Villa Park. Villa struggled to create and remain three points clear of the bottom three with Swansea eighth.  Scott Sinclair almost equalised late but volleyed over from 10 yards.